MEGA-TECH maintains an ISO-based Quality Management System (QMS) that stems from its ISO 9001:2000 certification held from 1996 to 2007. Our QMS includes documented and controlled procedures, internal audits, risk analyses and mitigation plans, and training. 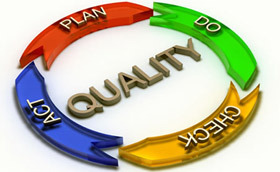 The System ensures that we continually provide our customers with the highest quality products and services. Quality management is inherent in our corporate culture, and we emphasize applying quality standards that focus on meeting each customer's needs. This means that our QMS is designed to deliver customized, tailored processes rather than a single approach applied across our customer base. In applying our QMS we emphasize solutions over blame, and instill confidence in our staff to proactively and effectively identify all potential problems and take the necessary action as expeditiously as possible to significantly mitigate or eliminate them.